An introduction to directions is here. The request for a direction, and the direction itself, will follow a period of discussion between officials (including Treasury officials) and Ministers. The formal documents are for the record, and the Ministerial direction will be drafted by officials. Here are some examples. 1. BIS officials sought a direction in early 2015 in respect of a payment to Hatfield Colliery in Yorkshire which was threatened with closure. The payment was authorised by Vince Cable, a member of the Conservative/Lib-Dem coalition, who will have been aware of the sensitivity of the pre-general election timing of the request, and the fact that the colliery was situated in the constituency of Ed Miliband, the Leader of the Opposition. The request for a direction is here and the direction itself is here. 2. BIS officials sought another direction after the election, this time to authorise the granting of free shares to employees of Royal Mail, which was being privatised. The request for a direction is here and the direction itself is here. 3. The next example - a direction in respect of a payment to the Kids Company - was much more contentious. The officials' request for is here. Ministers' response is here. This direction attracted a lot of interest in late 2015 as it appeared to be - and probably was - an example of Ministers getting too close to a charity led by a charismatic and media-savvy individual, and officials wrongly submitting to undue Ministerial pressure to continue funding well beyond what was sensible. Officials did eventually insist on receiving a direction before providing a further tranche of funding, only for the charity to collapse soon afterwards. There is a good NAO report on the saga for those interested in the detail. The NAO's summary noted that 'Officials repeatedly expressed concerns about Kids Company, but government continued to respond to the charity’s requests for funding. 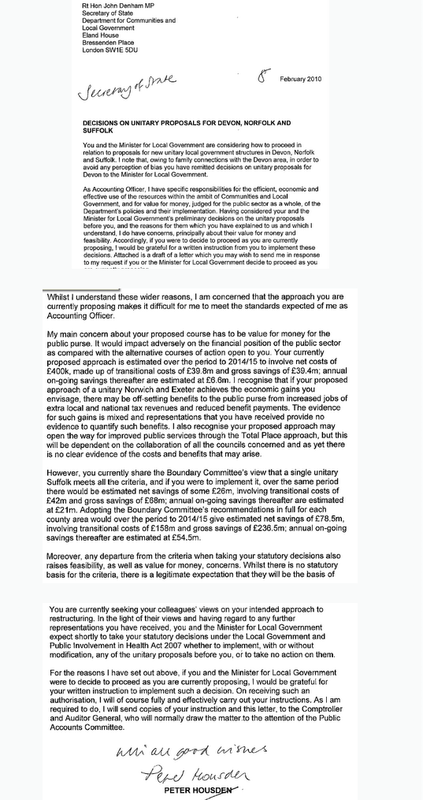 Briefings to ministers in 2002, 2005, 2007, 2010, 2012 and 2015 show that officials accepted Kids Company’s assertions that it would become insolvent without government grant funding'. MPs on the Public Accounts Committee were more blunt in their November 2015 report, describing officials as 'naive' and 'gullible', and refusing to believe officials' claims that they had felt under no pressure from Ministers. 4. 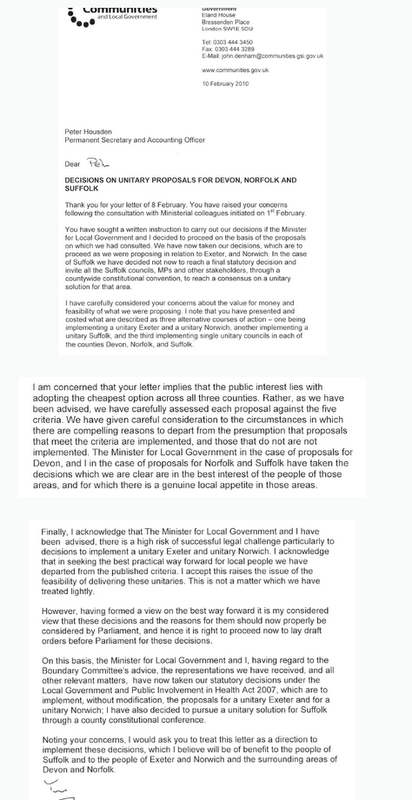 The Permanent Secretary of DCLG, Sir Peter Housden, requested and received a direction in 2010 from the Communities Secretary, John Denham, concerning the creation of unitary authorities in Devon, Norfolk, and Suffolk. Here are the two letters. Note Mr Housden's 'With all good wishes'! 5. There was another good example of the proper use of a Direction in 2018 when the Department for Education Permanent Secretary expressed concern about rushed preparation for the new T-Level (Technical level) exams. His letter to his Secretary of State noted that "it is perfectly proper for you to bring other considerations to bear, namely the high priority that the Government attaches to the programme". The two letters are here and here.